NANOGLOSS™ is a new generation of NANO-coatings used as Paint Protection for cars designed for simple hand application on “new” or newly reconditioned automotive and marine paint finishes, plastics and stainless steel. NANOGLOSS™ protects the surfaces against chemical attack from any kind of environmental pollutant, e.g., acid rain, animal and vegetable deposits (bird droppings and tree sap) and road grime, including salts and insect fluids, UV rays, limescale etc. The hydrophobic and oleophobic effects of the coating cause particles of contamination such as grease, oil, water, mud and materials from environmental pollution to adhere less to the surface, and allow them to be easily removed from the coating, i.e. without applying abrasive agents so called "Easy to Clean" effect. Our NANOGLOSS kit is Guaranteed for 10 Years for paint, plastics and stainless steel with BONUS NANO-QuarzGC for your windscreen. You need to buy Wax & Grease Remover from your local supplier like SuperCheap or Autobarn or any other local supplier. 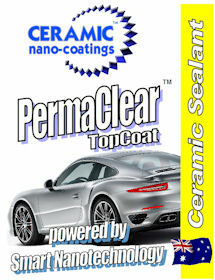 NANO-Coatings kit has three products that you need to protect your new vehicle with. NANOGLOSS™ is a new generation of NANO-coatings designed for simple hand application on “new” or newly reconditioned automotive and marine paint finishes, plastics and stainless steel. NANOGLOSS™ protects the surfaces against chemical attack from any kind of environmental pollutant, e.g., acid rain, animal and vegetable deposits (bird droppings and tree sap) and road grime, including salts and insect fluids, UV rays, limescale etc. The hydrophobic and oleophobic effects of the coating cause particles of contamination such as grease, oil, water, mud and materials from environmental pollution to adhere less to the surface, and allow them to be easily removed from the coating, i.e. without applying abrasive agents so called "Easy to Clean" effect. The new generation NANO-QuarzGC™ is designed to smooth glass or glazed ceramic surfaces to have less contact with grime particles. The hydrophobic and oleophobic effects of the coating cause particles of contamination such as grease, oil, water, mud and materials from environmental pollution to adhere less to the surface, and allow them to be easily removed from the coating, i.e. without applying abrasive agents so called "Easy to Clean" effect. NANO-Quarzfab™ is advanced fibre protection product, based on NANO-TECHNOLOGY, protect a wide range of fabrics and materials from water, dirt, stains and contamination from most liquids while remaining completely invisible. NANO-Quarzfab™ doesn’t affect the appearance, colour, breathability or handling of the fabrics and materials while at the same time are easy to maintain. 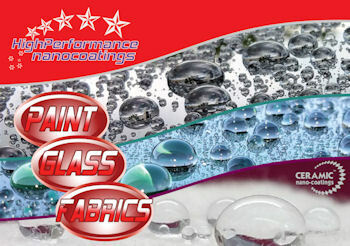 NANO-Quarzfab™ is extremely water-resistant on outdoor fabrics keeping them drier longer. When the fabrics are treated with our NANO-Quarzfab™, stains like oil, coffee, red wine etc. belong to the past. The new generation NANO-coating is designed to smooth glass or glazed ceramic surfaces to have less contact with grime particles. The hydrophobic and oleophobic effects of the coating cause particles of contamination such as grease, oil, water, mud and materials from environmental pollution to adhere less to the substrates, and allow them to be easily removed from the coating, i.e. without applying abrasive agents so called "Easy to Clean" effect. Enough of NANO-coating for glass to do two cars. When others are saying their NANO-coating for glass will last months, we are saying our NANO-coating for Glass will last years and years without need to reapply the coating. We guarantee our NANO-coating for Glass will last 10 years without a need to reapply on any automotive glass, including flat building glass, except windscreens where the wipers are in use. Windscreens are guaranteed for 5 years. 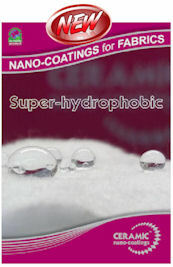 The advanced Super-hydrophobic fibre protection product, based on NANO-TECHNOLOGY, protecting a wide range of fabrics and materials from water, dirt, stains and contamination from most liquids while remaining completely invisible. Nano-Quarzfab does not affect the appearance, colour, breathability or handling of the fabrics and materials while at the same time making them easy to maintain. CERAMIC nano-coatings™ products are extremely water-resistant on outdoor fabrics keeping them drier longer. When the fabrics are treated with our CERAMIC nano-coatings™ products, stains like oil, coffee, red wine etc. belong to the past. » Household fabrics such as upholstery, carpets, pillows, cushions, sheets etc. The most durable, hydro and olio phobic (water and oil repelling) wipe on leave on (WOLO) paint sealant on the market! PermaClear - Top Coat is the most efficient way to impart the benefits of scratch and mar resistance without needing to exert any effort except wiping on the paint with overlapping strokes. No or little post buffing involved. The result is an extremely durable, glossy micro-coating that seals the paint finish to preserve its condition for a minimum of one (1) year. 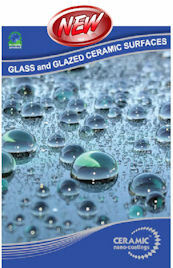 A breakthrough in aqueous ceramic polymer chemistry, Clean&Seal™ provides the most pristine clean on degreased paint surfaces by removing insolubles, like minerals from previous washings, embedded metals, bird droppings, protein stains, etc., before depositing a glossy, ceramic like layer of protection and enhancement. Ideally used prior to the application of a Ceramic Polymer Sealant, this cleaner / coating is extremely easy to apply: Simply wipe on the washed surface, allow product to sit for 20 minutes and then rinse clear. The result is a chemically inert, semi-permanent seal on the treated surface. Packaged in 100ml or 250ml. 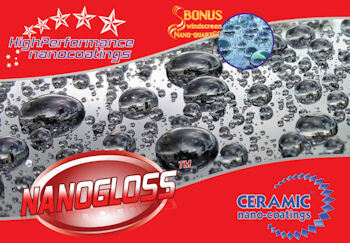 A breakthrough in aqueous ceramic polymer chemistry, Clean&Seal™ provides the most pristine clean on degreased paint surfaces by removing insolubles, like minerals from previous washings, embedded metals, bird droppings, protein stains, etc., before depositing a glossy, ceramic like layer of protection and enhancement. Used prior to the application of your Ceramic Wax™, this cleaner / coating is extremely easy to apply: Simply wipe on the washed surface, allow product to sit for 20 minutes and then rinse clear. The result is a chemically inert, semi-permanent seal on the treated surface. Packaged in 100ml. Very easy to apply, no hard rubbing or buffing! Ceramic Wax™ Ceramified Carnauba Wax contains durable, water and oil repelling polymeric-nanoparticle networks that chemically bond to the film / surface interface and form a ceramic-like polymeric matrix with the paint finish. In addition, the incorporation of highly refined carnauba wax resins within the matrix produces an ultra high gloss, deep wax-like finish. Easily wipe-on and wiped-down, the coating chemistry works to impart a glossy ceramic membrane within minutes. The result is a highly protective micro shield that allows for the easiest release of road grime to provide at least two (2) years of guaranteed added paint gloss and protection in a single application. Eco-friendly, and 98% VOC (volatile organic compounds) free. Quick Detailer Interior™ is the ultimate one-step product. It cleans and protects all automotive surfaces in one step. Use Quick Detailer Interior on paint, vinyl, hard rubber, metals, door trims, dashboards, plastics, and even glass*! You'll save time, effort, and money while achieving a clean, well-protected vehicle interior. Quick Detailer Interior does it all! One application lasts for months while each subsequent application is cumulative. 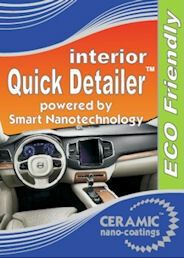 Quick Detailer Interior is a coating system that contains anti-static, grime repelling polymers. Made of Microfiber plush and Scrubbing waffle covering 6cm thick sponge inside. The Super Plush is highly suitable for washing gently and grubbing dust without the damage to the paint. It gives you the fastest way to wash your car without any risk of rough sponge. The other side is covered by microfiber scrubbing waffle fabric. It is specially designed to scrub and remove gently even toughest like bugs without any scratch.